SINGAPORE - The Government aims to maintain the foreign share of Singapore's workforce at the current one-third level, at a pace that the country can accommodate. 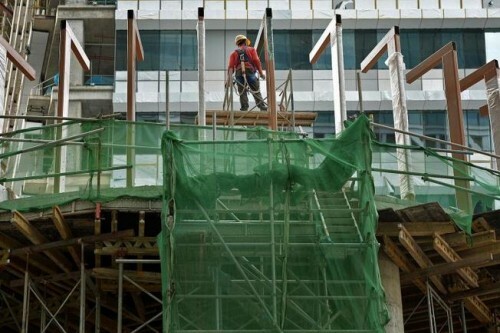 Responding to a question from MP Gan Thiam Poh (Pasir-Ris Punggol GRC) in Parliament on Tuesday, Manpower Minister Lim Swee Say said "this means that the pace of foreign workforce should grow broadly in tandem with the growth of our local workforce". Mr Lim told the House that overall annual foreign workforce growth has moderated from 144,500 in 2007 to 34,000 in 2014. The "significant foreign worker growth slowdown occurred in all sectors", he added. Excluding foreign domestic workers, the employment of foreign workers in the services sector grew by 21,500 in 2014, down from 54,500 foreign workers hired in 2007. Similarly, foreign employment growth slowed from 36,000 in 2007 to 9,700 in 2014 for the construction sector; and from a 42,000 foreign worker growth to a decline of 5,400 over the same period for the manufacturing sector. Mr Gan had also asked about the projected number of foreign domestic helpers, caregivers and healthcare workers needed over the next 15 years, in view of the ageing population in Singapore. Meanwhile, the National Population and Talent Division expects demand for foreign domestic workers to rise to about 300,000 by 2030, to assist with care-giving duties at home and supporting families with elderly and children. In reply to another question from MP Yeo Guat Kwang (Ang Mo Kio GRC) on foreign worker levies, Mr Lim said such levies remain relevant and "reducing or doing away with levies would not benefit Singaporean rank and file workers". This is because employers may then prefer to hire cheaper foreign workers to "maximise their quota" adding that "the salary of local workers may also be suppressed due to lower cost of hiring foreign workers". Mr Lim said it could also deter investment in "manpower-lean" technology and solutions. The foreign worker levies, along with other measures such as the sector-specific Dependency Ratio Ceiling (DRC) serve three purposes, Mr Lim elaborated. And they are to manage the demand for foreign workers, spur productivity gains and level the employment playing field for Singaporeans to sustain real income growth. Mr Lim reiterated that the challenge for all firms, including small and medim enterprises or SMEs is "to adapt to our new economic and manpower landscape". Various schemes are in place to help companies, including the Innovation and Capability Voucher to drive productivity gowth. About 16,000 vouchers have been awarded since 2012, with 90 per cent of the going to very small businesses. Mr Lim said the Manpower Ministry had also lowered the foreign worker levy for skilled work permit holders to encourage employers to upgrade the skills of workers, including work permit holders, so as to achieve higher productivity.